The thought of something historically significant, but invisible, being right under your nose the whole time…well, is there anything better? One of these such phenomenons was brought to my attention by a surprisingly baller exhibit at the Atlanta History Center on the South’s folk arts. I KNOW, you/me/we are so over folk arts, they’re wonderful, they’re everywhere, I get it, I’m a supporter, I have a painting on my wall and some tile art in a bathroom and a weird porcelain figurine in my car. I lived in Cambridge, Mass., for goodness sakes, I recycle, I’m crafty, I VOTED FOR HILLARY. I’m obviously about that folk-art life. But even I had not heard about jugtowns. And that is where this exhibit got really interesting. Think about it. You’re living in Georgia or North Carolina in the mid-1800s. You’re a farmer, like everyone else. You’re sitting on your porch miles away from the nearest neighbor, let alone a store or a port that would bring in goods. And all you’re thinking is, wouldn’t it be great if I could just bring some water out to the fields with me? These pretzels/cornmeal are making me thirsty! People need to put stuff in stuff. That, my friends, just may be a universal truth. During the heyday of jugtowns, the North was industrializing and had greater access to stores and purchasing, but in the South, that was not the case (especially once the Civil War cut off trade between the North and the South). All they had was a whole bunch of that red Georgia clay. Just as Western settlers made homes out of dirt and sticks, Southerners made the objects of their lives out of the materials that were around them. So… clay it was. Clay vessel production was so essential in the South that entire communities cropped up around the industry, called jugtowns. North Cah-lina had a jugtown. South Cah-lina had a jugtown. And Georgia’s big jugtown was located right where we grew up in Atlanta, at the intersection of Howell Mill Road and Northside Parkway in the Buckhead neighborhood. THAT’S RIGHT, we grew up in a jugtown. Jealous?? This particular jugtown specialized in containers for distilled whiskey, which makes sense, because I knew that spot to be a popular parking lot for underage drinking. If you ask me, this is a history we need to celebrate a lot louder. Forget the heritage of coal-mining towns and everyone competing over where to host the Olympics next. We have this great (former) industry right under our feet! 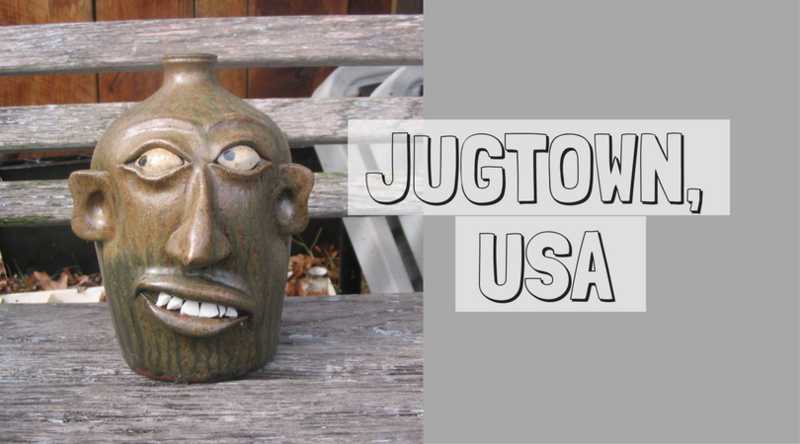 Atlanta’s Buckhead neighborhood could get a lot edgier by rebranding itself as Jugtown. They couldn’t have named the massively popular new soccer team the Jugs? It rhymes with chug! The Potters? Let’s ride the coattails of a popular wizarding franchise! Plus, it’s so 2017. Buy local! Support small businesses! Artisanal! Hand Crafted! Small Batch! Know where your goods come from! And if we don’t do it, Brooklyn (ugh) will; the NYT is already on it. I’m not saying the Bushwick pottery scene is a bunch of carpetbagging cultural-appropriators, but it’s time to reclaim the hipster pottery scene for the South. After all, we have the clay.